Does your employer offer a flexible spending account, but you don’t have one? Maybe you’ve opted in to a flexible spending account, but are unsure how to use it. Let’s get back to basics and understand what a flexible spending account is and how useful it can be for necessary medical purchases. There are items you probably never even realized that qualify! A flexible spending account, also known as a flexible spending arrangement and often abbreviated as “FSA,” is an account you may opt in to in conjunction with your employer to help pay for medical expenses. The list of eligible expenses is generally regulated by the IRS so there usually isn’t a lot of variation among insurers. These expenses can include prescription medication, coinsurance, copayment, deductibles, dental and vision care, and more. You, the insured, choose the amount you want in that account for the year. The amount you choose is broken out into small draws (rather than a lump sum all at once) that are siphoned off your regular paycheck before taxes. For example, if you get paid bi-weekly (26 paychecks per year) and opted in for an FSA of $500, you’d have roughly $19 pulled out from every paycheck to support it. It’s important to note that even though the funds are pulled throughout the year, you have access to the full amount starting at the beginning of the year. So why would you set aside money in an extra account when your insurance covers the majority of your expenses? The key here is that the funds you allocate to your FSA are taken out of your paycheck on a pre-tax basis. Pre-tax means your dollar can go further than after-tax dollars used for medical expenses. You’re saving money before you even set foot in the doctor’s office. Plus, depending on your benefit plan, your employer may even contribute or match your contribution — more free money! Even if you don’t have a specific health condition that requires you to go to the doctor regularly, there are several expenses you may think of as “routine” that may be covered by an FSA. 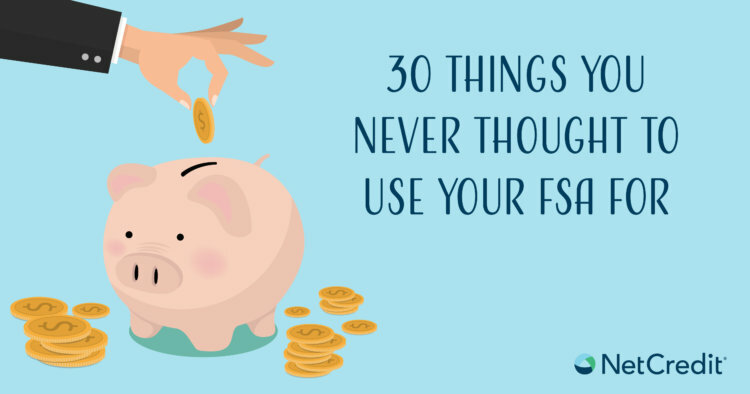 We’ve compiled a list of some common ways to use your FSA beyond typical copays. Before we head into the list, please note that the list of purchases you can make with your flexible spending account are subject to IRS guidelines and can change from time to time. Make sure you do your own research to determine what items are may be FSA eligible before making a purchase. The information in this article is provided for education and informational purposes only, without any express or implied warranty of any kind, including warranties of accuracy, completeness or fitness for any particular purpose. Check with your employer, professional advisor, the IRS for a detailed list of FSA-eligible items. The information in this article is not intended to be and does not constitute financial or any other advice. The information in this article is general in nature and is not specific to you the user or anyone else.